Garden Re-Leaf Day is the Greenfingers Charity’s national fundraising event taking place today, Friday 22nd March. Rolawn, along with many other horticultural companies, is once again getting involved to support the event and raise funds to build magical gardens for life-limited children and their families who spend time in hospices across the UK. 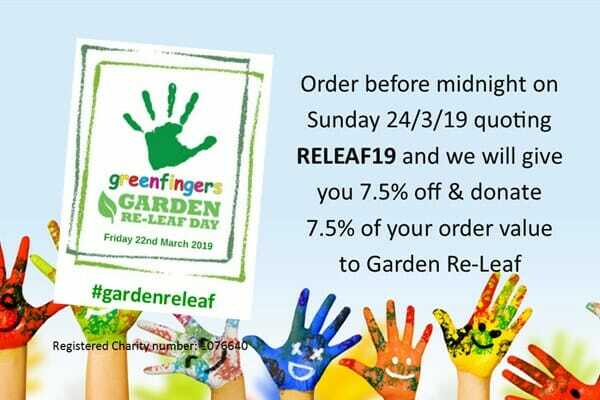 To help raise funds for this very worthy cause, customers purchasing from Rolawn Direct between Friday 22nd and Sunday 24th March 2019 can benefit from a 7.5% discount and Rolawn will match this by making a donation of 7.5% of the order value to Garden Re-Leaf.